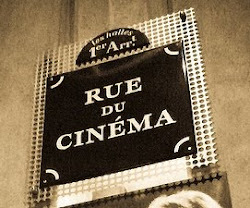 One of the things that appealed to me when I was working as a projectionist was the fact that if one of the Lumière brothers had made an unexpected visit to my cinema, they would have been able to load the projector and screen the film. The central parts of the projector was the same as it had been since the very beginnings of film projection. Now this is no longer the case. Today, not only is the equipment different, but everything around it too. There is not even a need for a projectionist any more. In the more advanced systems, a computer in the basement of the multiplex will be enough. The computer might not even be in the cinema but at the main office of the cinema owner. Instead of a person in a small (and hot) room at the back of the screening room putting the film through the projector, and pushing the proper buttons and switches, somebody is just readjusting some software, or inserting a flash drive. I am glad that I no longer work as a projectionist because, besides being demoted to a popcorn pusher, I would not have any personal investment in the screening. When I worked at the cinema, it was my fault if something went wrong, but I could take a lot of pride in a successful screening, when I had dimmed the lights and opened the curtains at the exact right moment, for example having the UIP trademark appearing at the very moment that the curtains were so far apart that the logo fit perfectly between them. But it is not only in the projection room that the physical film strip was your's to touch. In all stages of the filmmaking process, it was there. You shot on it, you edited on it, you screened on it, and you stored the film on it, in the archives. You could hold it and touch it, making the material of the art form almost sensual, a haptic experience. Many filmmakers loved the sensation of having "their" film strip in their hands, Ingmar Bergman being one of them. A lot has been written about the dangers involved in the conversion from analog to digital, such as analog cinemas difficulties in getting films that are released digitally only or the danger of films not being preserved in a long-term perspective (This article from LA Weekly highlights some of these dangers). What I here today is concerned with is the lack of physicality, and the immediate connection between film and hand, between object and subject if you like. Is there not a danger that when the film strip is gone, film gets devalued, possibly even as an art form? Another thing that gets lost with computer-generated imagery (CGI) is a sense of awe. When you watch a film like Intolerance (D.W. Griffith 1916) or a later film by David Lean, it is the sheer scope and richness of the images and all that the images contain, the number of people and horses for example, that is part of the magic. At the end of the The Avengers (Joss Whedon 2012), New York is attacked by hordes of faceless creatures from another world, but it has not the same effect because I know that some programmer made one creature on his computer and then copied it, and what is awe-inspiring about that? There is a legendary quote from Michael Curtiz, "Bring on the empty horses. ", which he said when he was making Charge of the Light Brigade (1936). Today the director would more likely say (if s/he had Curtiz's poetic relationship with the English language) "Bring on the empty software. ", which is not quite the same thing. Of course, when Terminator 2 (James Cameron 1991) and Jurassic Park (Steven Spielberg 1993) came out, a sense of awe and wonder was there, not despite them having fantastic digital effects, but because they had them. Because it was new and amazing. But today, that sense of wonder of something new is long gone. How will cinema reinvent itself this time? The studios have tried with 3D but that has not (yet) really worked, and besides, 3D is not something new. There are amazing films being made out there, and technical progress is inevitable, and often-times a good thing. The likes of Michael Mann, Abbas Kiarostami and Zhang Ke Jia make wonderful use of the digital possibilities. But that does not mean that some things will not be lost on the way, or that people can succumb to irrational exuberance. Many a cineaste have had themselves photographed in a similar way (myself included). But will such an image be understood by future generations? With the rapid disappearance of analog film, nowadays usually made out of polyester, when will the very idea of the touchable film strip be a thing of the past? 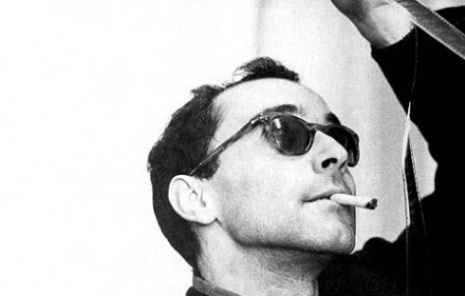 The final question is this, what will a future Godard be photographed holding up? Last year I gave a lecture on digital cinema and realism (with some ethical concerns thrown in for good measure) and I might some day publish it here. This week it is the Hitchcock blogathon, with the aim of raising money for the National Film Preservation (look here for further details), and I had intended to write a solid post, but alas time was too short, and hence the post will be short too. I thought I just embed a clip here, from the second version of The Man Who Knew Too Much (1956), because it is pure Hitchcock. It is a sequence that shows an ordinary man walking on an ordinary street, yet the tension and paranoia is running amok. Almost everything here is in the camera movements (and sound), more so than the movement of James Stewart. We are seeing Stewart, not Hitch, but we can still feel Hitch, walking in front of Stewart, or beside him, or behind him. It is a rare feeling, the overwhelming, tangible, foreboding presence of the filmmaker. Painful list to make, since I had to leave out other great films, by which I mean The Ring (1927), The 39 Steps (1935), Young and Innocent (1937), Rebecca (1940), Suspicion (1941), Shadow of a Doubt (1943), The Trouble With Harry (1955), Vertigo (1958), North By Northwest (1959), Psycho (1960), The Birds (1963), Marnie (1964) and Family Plot (1976). Due no doubt to a bureaucratic oversight I was not invited to send my top ten favourite films to Sight & Sound's decennial poll. But I can still share that list here, for all the world to read. So then, here is the top ten list. The films are in chronological order. It is remarkable that three of the films are from 1946. Some year.